Al was inducted into the Rockabilly Hall of Fame in April 2008 by Bob Timmers. What an honor it was for him to be inducted into the hall of fame. The Rockabilly Hall of Fame is located in Tenn. Al would like to thank Bob for the web site and the induction. You can go to his web site: www.rockabillyhall.com/alhendrix.html check it out! Al Hendrix was born Clyde Allen Hendrix on November 12, 1934 in Miami, Florida. Later that year his family relocated to Lynwood, California and stayed until 1945. They moved back to Tampa, Florida for two years before settling in Odessa, Texas. Al listened to the Grand Ole Opry every Saturday Night and was inspired by the music of Hank Williams, Sr. As a teenager, he began playing rhythm guitar to accompany his singing, and his startling expressive voice won him first and second place in local talent shows. In March 1953, Al enlisted in the army. He served for three years, including an 18-month tour of duty in Korea. When Al left the army, he came out to a significantly changed world of music. Rock & Roll was the latest craze, and Elvis Presley became Al’s new favorite. Al settled in Bakersfield, California, and it was here, at the Blackboard Café, that Al met Buck Owens. Al and Buck made music together, often with Bill Woods and The Orange Blossom Playboys. Around this time, Al made his television debut on the Los Angeles based show “Rocket to Stardom", which he took first place. In 1957, Joe Keplinger (aka Jolly Jody) hired Al to be the lead singer for his group, Jolly Jody and The Go Daddies, and they packed in 3500 at the county fairgrounds in Bakersfield. With the Go Daddies, Al recorded “Rhonda Lee” and “Go Daddy Rock” for the Tally label. The two sides were picked up by ABC Paramount in February, 1959. During this time Al also appeared on Cousin Herb Henson’s TV Show, called the “Trading Post Gang”, in Bakersfield, CA, where Buck Owens was a regular. Al later signed with LaGree Records in Hollywood. The initial recordings were “I Need You” and “Young and Wild”, cut at Gold Star Studios and issued in 1960. Liberty Records leased them for nationwide release. “I Need You” was number one hit in El Paso, Texas for 6 weeks. Alan Freed was playing the flipside “Young and Wild” every hour on his radio show in Los Angles. “I Need You” also made the top 20 in San Diego. In 1960 I appeared on the 'Wink Martindale' TV Show called "PACIFIC OCEAN BEACH" which was the West Coast "American Band Stand." The song that I sung was "Young and Wild." Al then recorded in 1962 “Monkey Bite” and “For Sentimental Reasons” at Gold Star Studios. “Monkey Bite” got great reviews but limited distribution because the lyrics were sexually descriptive. The Pike session produced two more tracks, “Jumpin’ Johnny” and “Fooling Around” which remained unissued until 1985 when White Label in Holland released them. During these years, Al played all over the Los Angeles area at county fairs, shopping centers, clubs, and military bases in Southern California. He also appeared on the Bakersfield television shows hosted by Jimmy Thomason. One of his bands was Al Hendrix and The Country Mixers, which performed on radio, TV, and at entertainment centers in the area. 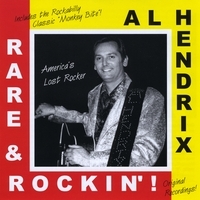 Al Hendrix can also be found in the 'Bakersfield Music Hall of Fame' in Bakersfield, California. He helped contribute to the "Bakersfield Sound".